﻿What REMEMBER THE TITANS did for sports movies, MOST VALUABLE PLAYERS does for musical theatre. 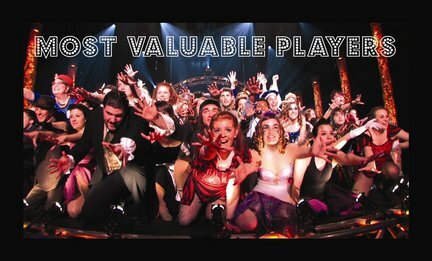 The story goes that director Matthew Kallis was surfing YouTube one day, when he stumbled upon some clips from "The Freddy Awards", a local awards show in Pennsylvania which honors local high school musical theatre productions (think The Tony's for high school). He's so captivated by these clips that he takes a trip out there and, spurred some by his own musical theatre background, decides to document three high schools as they rehearse their big show, wait for the nominations, and culminating at The Freddy's. Kallis takes us into a world that not many are aware of. Musical theatre is hard, demanding, and exhausting. It takes hours upon hours of memorization, learning routines, blocking, and endless repetition just to pull off a show for three nights. And that doesn't even include all the technical designs that go into a production. Just like sports, theatre is a team effort. You have to depend on your cast mates to get you through, not only onstage but handling the pressures offstage as well. Oh yea, plus you have to go to school. We follow each of the three schools through their successful productions with one putting on Bye, Bye Birdie, while the other two tackle the challenge of Les Miserables. The joy the kids experience when performing is absolutely infectious. They know theatre isn't the most highly respected path in the high school world, but it doesn't matter. Even though they're theatre geeks through and through, at least they're theatre geeks together. They can lose themselves onstage and make people happy. It's refreshing to see so many kids come to the realization at a young age to do something because you really love it. As the looming nominations of the Freddy's approaches, the directors remind their cast that a nomination would be nice, but in the end, it's about performing for yourselves, so don't be disappointed if the results aren't what you want. The kids agree, though you can see it in their eyes, like sports team, that they want that nomination/win. The highlight of the movie is watching the kids react when their respective schools and some of them get nominations. The excitement and euphoria on their faces is so infectious, I found myself excited for them. A lot of these kids have been ostracized by their peers at some point in their lives, and to finally be recognized and accepted by the community is the ultimate highlight in their high school careers. In a time when education is in crisis around the United States and when budgets get cut, the arts is the first on the list. For one of the schools, the cost of the production is $16,000, and the students raised all the money all on their own. Such dedication. Also, the camaraderie and teamwork shown from all the students is the equivalent to any sports team out there today. Kallis's documentary is the ultimate love letter to the musical theatre world.